It is with great joy that I can give you the following news. The second school room is now almost complete and will be finished before the winter sets in. The Middle School pupils in the first class room will be sitting exams in March, and the icing on the cake, so to speak, is that we had visits from two important education officials within days of one another. Both the civil servant from the education department in Peshawar and the EDO from Chitral were really enthusiastic about our school. They admired the layout (the rooms all face on to a meadow with trees), the rooms which have been built with many windows to let in the air and light and very happy that we have started a library. They reminded us that we still had to build two more rooms – science/art room and a computer room for the school to qualify as a government high school (approx. £15,000 for the two rooms). See 2015 ‘Wish List’. They reiterated that we had the required amount of land, that our washrooms were fine and that we had an excellent kitchen, now replete with refrigerator and hot water heater, except we have not yet had a heavy duty electricity line installed. That, hopefully, will be done before the year is out. They both said they will help us to push for Government registration once the school has been registered first as a private institution. We shall have to carry on with the payment of the salaries until then, for which we now should have sufficient funds thanks to our friends. We still need to repair the school retaining wall before the spring floods – approximately £1,000. I have two patients to bring down next month and at some point in time, a young boy who has already had two leg operations for a broken leg in Chitral, which were not performed properly and I have promised the father I shall bring him down when it is possible. Both brothers of Janus, who act as my alternate housekeepers/chowkidars, both had their wives in the hospital very ill, plus one also had his daughter, who had to have daily injections and had kidney problems. Then came the part time mali with his daughter in the hospital with kidney failure and the other daughter with epilepsy. My dear, Akthar Bibi, who was one of my night nurses and is our sweeper, fell ill and had an accident. If it had not been for funds provided by you and one particularly very generous donor, all these people mentioned above would be in dire circumstances. Janus, my driver and PA, has said he will no longer work in the office as he cannot deal with the digital age. He has had no education and is computer illiterate. He also has no time. Besides driving me, and driving and taking care of patients, he takes the car to the workshop (usually a daily occurance! ), he goes to the bank which is all the way down town, sometimes he has to go to the Old City to another bank, he is the one who goes and pays the bills, sees to the electricity, water pumps, etc. He is always busy. We deal with a number of Govt offices and the provincial govt is not yet digital. We receive many communiqués and I write many memos and faxes. This requires filing and obviously knowing where everything is. We now need a new filing cabinet. I need someone who can use the computer, operate the scanner and fax machine. We often receive calls from Govt offices etc. It is important I have someone to answer the phone. Often the call is in Urdu, of which I know only a little. When I am in Birir, I need to communicate. I have no internet there. Writing in longhand, getting someone to trek in to Chitral, send by fax to Janus for him to put in an envelope and mail off is just not viable… I need someone to whom I can dictate a message and for him to email. I need R10,000 per month for a young part time worker – that is the minimum wage (£60). We are also without a night guard – again, due to lack of funds. According to the press, the militants are posed to attack the cities. Extortion and kidnapping was endemic. Supposedly, now, there is some control?? R14,000 per month (£85). Long-term supporters of HKCA will remember that my personal medical work started in Birir as the proverbial ‘barefoot doctor’ (I am a qualified emergency medical technician – qualified in NYC) and then we gravitated to building and stocking dispensaries. From that we started the patient programme. Three years ago the Red Crescent moved in and joined the rather useless government dispensaries and treated patients and carried medicines. They are now ending their programme, so I am now keen to reopen our dispensaries. 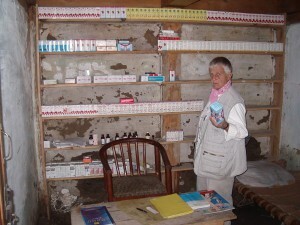 The one in Shaikonondai in Rumbur we had continued to stock with medicine for the main winter months. I now need to do this for all four of our former dispensaries. To stock the dispensaries will cost approx £300. This is a small outlay to be able to save, perhaps, the lives of small children. In the winter months, the village of Shaikhonondai in Rumbur is cut off by snow. It is a two hour trek to the nearest Kalash village of Balanguru where there is a govt dispensary (usually without medicine!). I am continuing to do govt projects and am currently building a bridge and redoing the steps we made some years back in Guru Village, Birir. We had done them in stone and then someone came along and redid them in cement, so now we are bringing them back to stone! I have been fighting for years to have Guru made the heart of a WHS (World Heritage Site). 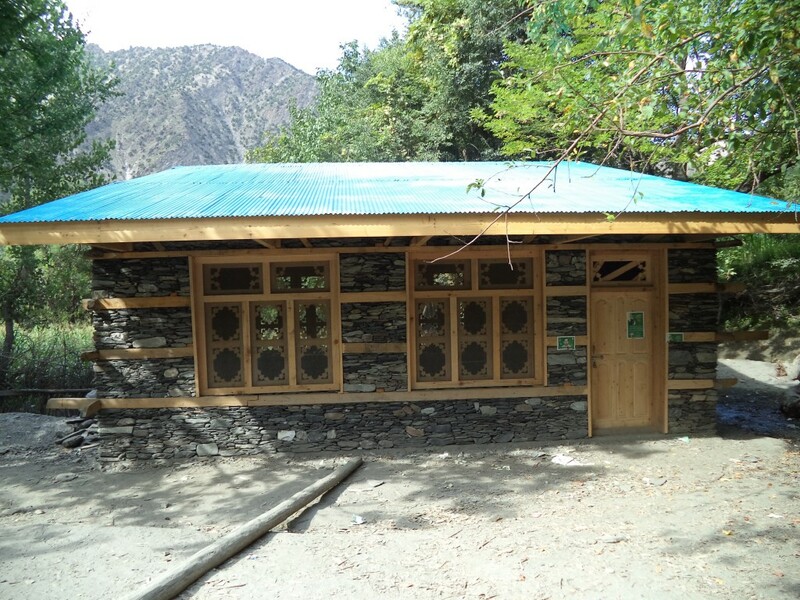 Now, to begin with, the director of archaeology is making Guru the first protected area in the Kalash valleys. 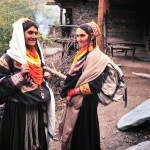 Guru Village is the most prominent village in Birir Valley – reputed to be first inhabited seventeen generations ago, when the Kalasha came over the mountains from their homeland in Nuristan, Afghanistan. 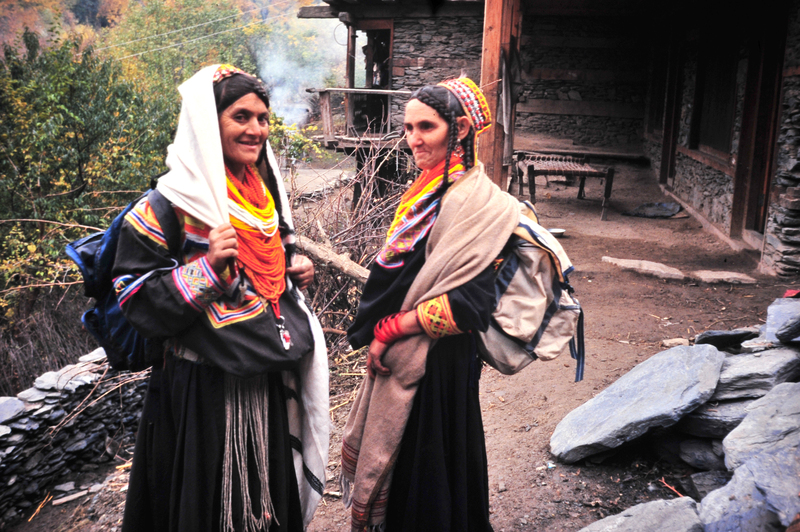 Kalasha history places Waigal as their former home with religious links to the Parun Valley. mountain ridge of Guru, after the last houses, faces east towards the valley of Bumburet. The houses straddle the mountainside with the roof of one acting as a terrace for the one above. Many of the stone and wooden houses are built on stilts with interlocking beams; they are so constructed as to withstand earthquakes. 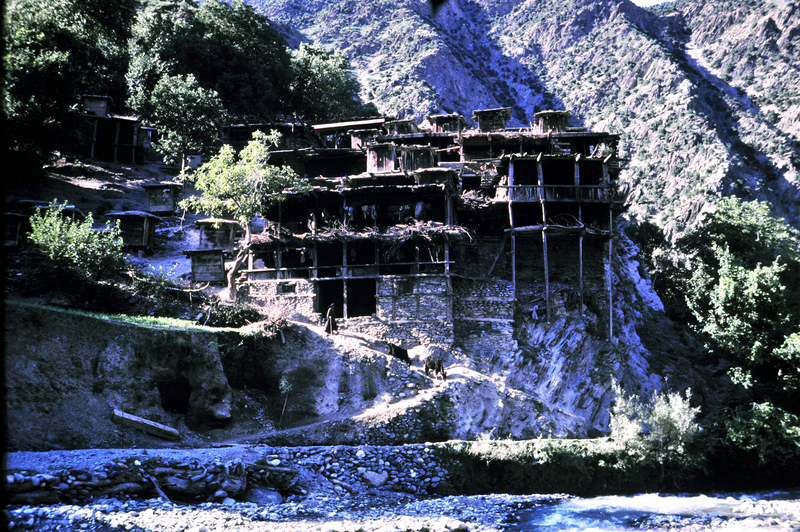 They are miniature replicas of the citadel villages of Nuristan. The ruins of such villages are to be found in Urtsoon, Jingeret Ku and Shishiku. In Rumbur and Bumburet there are also similar villages, but they have been corrupted with cement dancing places, steps, jestakhans and metal roofs. Below the village lies the main river. Down river is the village of Ooeri. Up river is a Bashali House and a mosque. Above is the Muslim part of Guru separated by a nullah. A suspension bridge spans the river which is in urgent need of repair. The wooden slats were repaired last year, but now the stone structures need repairing due to floods. Also the construction of a huge badly built retaining wall, is not only spoiling the whole view of the Guru landscape but is a danger to this bridge and to the village of Ooeri and the bridge there. According to recent reports, the fields were washed away due to the Guru nullah flooding into the main river and then channeling past this wall and hitting the fields. On the other side of the bridge is a nullah which leads up to the village of Grubiniasar, Grubba Quoie and the community school which is now being made into a middle and high school for girls. On the river bank are fields and a small bazaar. Health-wise, I am doing fine. My doctors have passed me as A1. Things I could not do last year, I find I can do this year. Rehabilitation is slow and I still try and stay in a controlled, safe environment. Next week, I have an appointment with my surgeon. Next year, I hope to be able to travel abroad to promote my new book (see publications page). At last, I hope shortly to get a new vehicle… unfortunately, not much came in from our appeal(!) but with selling my old clapped out land cruiser and selling a few shares I am just about rustling enough together to be able to get a second hand number two Toyota, which will give me back my freedom, which I have so sadly missed. Crossing the Lowrie in a broken down vehicle or uncomfortable borrowed one is no fun! To all of you who have given to our various appeals, a deep felt thank you – Maureen.